My profession means the world to me. Since I was very young, I wanted to help people, to be artistic, and to work with my hands. Dentistry is the profession that allows me to do these things: compassion for people, unique artistry, and the satisfaction of creating healthy, radiant smiles. Being a dentist allows me to improve the life of each person who comes into my care. In some cases, I may be seeing them for a checkup and offering advice about changing their home oral hygiene processes. At other times I move the person out of pain, restore function, and ensure they are able to enjoy all that life offers. And sometimes I am making changes to a person’s smile: boosting their self-esteem and the confidence with which they greet the world. Every patient and each interaction presents the opportunity to touch that person’s life, to make things a bit easier for them, and I appreciate each of these moments. 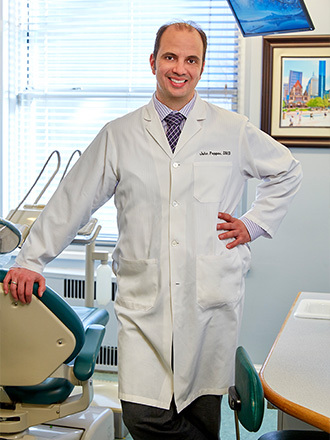 Masterpiece Dentistry at Copley has been part of the Boston community since the 1880s. We are one of the longest continually operating dental offices in the country, combining old-fashioned personal service with leading-edge care. Our team members have many years of collective experience and are some of the best people in Boston. They are truly the best at patient care and professionalism, and each is warm, kind, and compassionate. They enjoy continuing education and like to apply what they learn to patient care and to share their knowledge with our patients. My team members share my belief that the most rewarding part of our work is the relationships we foster with our patients. We value each as a person — first and foremost — and take time to learn who they are. We want everyone to know we care about their well-being and hold most dear the trust they place in us. Each year I seek out continuing dental education opportunities, constantly learning about new technologies, methodologies, and materials. This steady learning ensures I am prepared to deliver the best care, using the most appropriate techniques, to my patients. I am an active member of the Spear Study Club and have completed numerous hours of postgraduate education in Invisalign® clear aligner therapy. In addition, I am a member of the American Dental Association and Massachusetts Dental Society. These organizations offer many educational opportunities, including conferences, lectures, seminars, and refereed journals. I am the director of the folk dancing ministry of the Greek Orthodox Archdiocese in Boston. This is a volunteer position with a nonprofit organization. I have been director since 2003. I am also on the committee of the Alpha Omega Council in Boston, a nonprofit organization for the preservation of Hellenism in New England. Finally, I am a member of the New England Hellenic Medical and Dental Society. I have lived in Squantum, a neighborhood of Quincy, my entire life. When I’m not seeing patients or learning new dental techniques, I am most often found with my lovely wife Ourania and our daughter, Maria, who was born in June 2018. I also find time to play ice hockey, work out, and teach traditional Greek folk dancing.